It’s usually not until mid-December that we have a reliable amount of snow on the trails near Seattle. But when we do, the mountains outside of Seattle turn into a beautiful winter wonderland. Most of the popular summer trails can also be hiked in the winter with your dog by merely strapping on a set of snowshoes (you, not your dog of course. Ha, ha.). 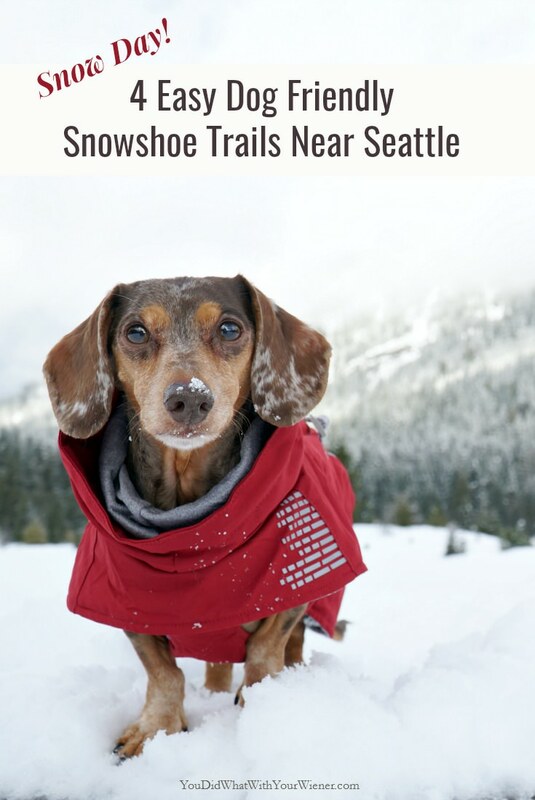 Here are 4 spectacular dog friendly snowshoeing trails in Washington State for beginners or those looking for an easy jaunt. Both of these snowshoe trails are less than 1 hour from Seattle. They’re located along the Interstate 90 (I-90) corridor. Because of their ease and proximity to Seattle, they can be VERY crowded. The good news is that beginners will have company along the trail. The bad news is that parking can be difficult and you’re unlikely to experience a lot of peace and silence. These trails are amazing though and offer a lot of bang for your buck – relatively easy to get to with one of the greatest rewards in the state at the end. If you want to avoid the largest crowds, I suggest going weekdays or early mornings (the parking lots often fill up by 9 am). Gold creek pond is a naturally-restored gravel pit that was created in the 1970s and early 1980s when I-90 was being built. I know that sounds like it could be boring but it’s really quite beautiful there. You can barely tell that it’s not a natural pond. Looking north, on a clear day, you can see Chikamin Peak in the Alpine Lakes Wilderness. This one is one of the easiest snowshoe trails on the list. It’s about an hour east of Seattle and parking is right off the freeway. Once you park in the Gold Creek Sno-Park, you’ll hike down the road and tirn north onto a side road. It’s about 1/3 mile to the real trailhead. From there, it’s a gently-rolling, 1-mile jaunt around the lake. If you just do the road to the pond and loop, the trip will be about 2 miles. If you’re feeling good and looking to go further, hike up one of the trails back into the forest on the east side of the lake, accessed via a small trail that branches off the Gold Creek Pond loop. You’ll meet up with a snow-covered road and it can extend your trip by at least a mile before narrows into a tight, avalanche prone valley. Head east on I-90 out of Seattle to Exit 54, 2 miles east of the Snoqualmie Pass summit. Exit I-90, turn north (left if coming from Seattle), crossing under the freeway. A few hundred feet north of the highway interchange, is Forest Road 4832. The whole road is considered the Gold Creek Sno-Park in winter. Find a place to park here, walk east to Forest Road 142 (not plowed in winter), turn north, and walk about 1/3 mile to the Gold Creek Pond parking lot. The trail for the lake loop starts from the northwest corner of the parking lot (back and to the right). Forest Road 4832 is narrow and often icy so, unless you have all wheel or 4-wheel drive and can pull off far enough to let a car pass, it’s best to park closer to the freeway exit and walk the short distance down the road. A Sno-Park pass is required for parking. See below for details. This trail ends at a 70/foot waterfall nestled near one of the elevated portions of I-90. You’ll barely see the freeway though because you will be too focused on the spectacular waterfall itself. And the noise? The waterfall is so loud, you barely notice that either. Water dripping off the rocks surrounding the waterfall freezes in winter and makes the area look even more impressive. In the winter, you have to park right off the freeway exit and walk up the Denny Creek Road to the Franklin Falls trailhead. Except for the very short, steep section down to the falls, and the couple really brief uphill sections on the trail, this hike is mostly flat. Do be aware of the distance though. 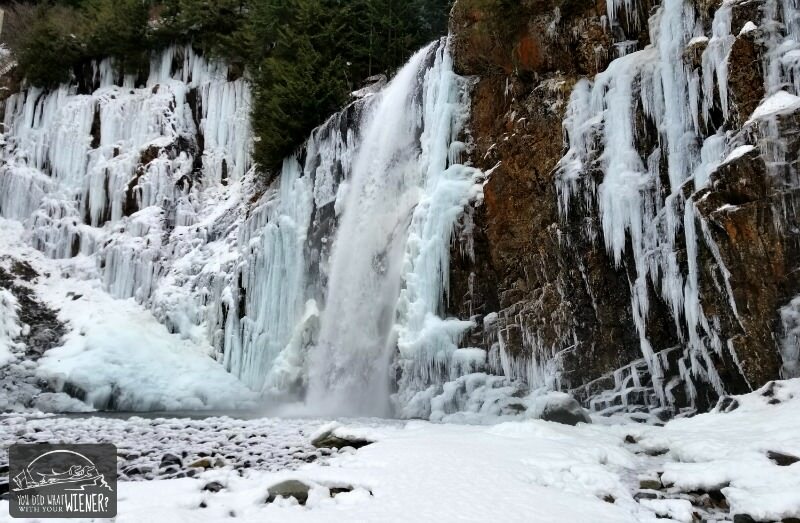 In the winter when Denny Creek Road is closed, the total trip distance is close to 7 miles (wheras the Franklin Falls hike is only about 2 miles in summer). Although the mostly flat grade makes this trail easy, the distance can make it more challenging for people and dogs that aren’t used to hiking that far. A hike this long can easily take 5-6 hours. Once you start at the trailhead proper, you’ll be walking along a creek with peek-a-boo views. It freezes over in spots too and is quite beautiful. There are a few privately-owned cabins, such as the semi-famous little red one below, that make for good photo opportunities. The section down to the falls can get scary icy so, although some people walk this trail in winter in regular shoes, trail crampons/spikes or snowshoes are highly recommended to keep you from slipping and falling down the small cliff to the river. I’m not trying to scare you – it’s way worth it – I’m just saying be prepared. There are actually two ways to get to the falls. This is the most common. From Seattle, head east on I-90 to exit 47 Denny Creek/Tinkham Road. At the top of the exit ramp, turn left and cross over the freeway. Go 0.2 miles and turn right at the stop sign onto Forest Road 58. You can park anywhere between here and the end of this road as long as it’s not signed no parking nearby. Hike up Denny Creek road until you see a bathroom on the left. Turn left here and you’ll find trailhead for the falls beside a billboard on the right. No pass is needed to park along Forest Road 58. Lake Wenatchee is a gorgeous glacier-fed lake located just to the east of the Cascade mountain range. It’s waters are blue and it’s surrounded by mountains. There are flagged trails in both the North and South Part of Lake Wenatchee State Park. These trails take scenic loops thru the park, along the Wenatchee River and along the lakeshore. It can be a little windy at the lake but it’s pretty amazing when the sky is blue and the water is glassy. If it’s a little stormier, it can still be beautiful and you’ll be mostly protected from the wind when you’re walking through the trees. The trails start adjacent to the parking areas. In the North part of the park, there are two loop options that are about 2 miles long each. The map does caution that these loops may not be complete – at least not on snowshoes – in early or late season when snow cover is low. The South area loop is about 1.8 miles long. Both loops are relatively flat but I know at least the south one has some really short, really steep hills that are sure to get your blood pumping. The South Park trail is marked with interpretive signs that have animal tracks and a riddle prompting you to guess the northwest wildlife that matches the animal tracks shown. That makes this loop pretty great for kids but my hubby and I really liked guessing and getting to the next sign to find out. Click here for a map of both the north and south loops. 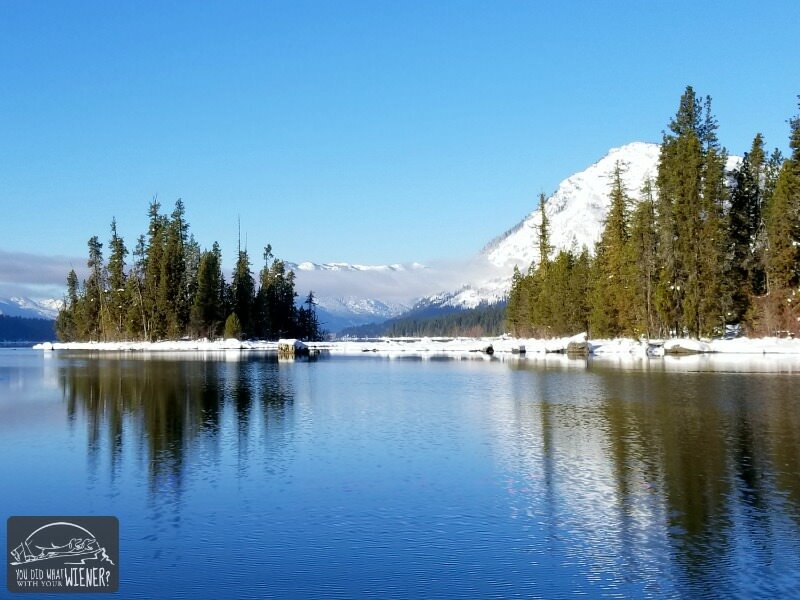 Lake Wenatchee is about 30 minutes from Leavenworth so you can make an overnight or weekend adventure out of it by combining it with the trail below. From Seattle: Head north on Interstate 5 to Exit 194 for US 2 east/Snohomish/Wenatchee. Drive across the trestle and stay right to Monroe. Keep driving east through Gold Bar, Skykomish, and over Stevens Pass. From the pass, drive 24 miles and turn left onto State Route 207 at Coles Corner. To access the south part of the park: Drive 4 miles to Cedar Brae Road. Turn left and follow to park entrance. Parking is located next to the main beach area. To access the north part of the park: Drive 5 miles on State Route 207, veer left after crossing the bridge over the Wenatchee River, then take a left towards the park entrance right after. A pass is required for parking. See below for details. This trail is the shortest of the bunch listed (if you do more than 1 loop at Lake Wenatchee). Honestly, it’s probably the least impressive too. However, it still makes my list because it’s one of the best dog friendly snowshoeing trails in Washington for beginners and it’s one of the few dog friendly snowshoe trails near Leavenworth. This just-short-of-2-miles trail follows the Wenatchee River and crosses Blackbird Island, one of the City of Leavenworth’s best kept secrets. From the trail, enjoy views of cascading waters and the surrounding mountains. If you are lucky, you might even see some wildlife. If you are only going to Leavenworth (not also Lake Wenatchee above first): From Seattle, head East on I-90 to Snoqualmie Pass. From there, continue east to Exit 85. Turn left, cross over the freeway and head east towards WA10/970. Follow to 97N over Blewett Pass and head west (left) where you meet up with HWY 2. You’ll reach Leavenworth in about 5 miles. If you are stopping at Lake Wenatchee first: Use the directions above. To get to Leavenworth from there, head back the way you came to Cole;s Corner. Turn left (east). In about 20 minutes, or 15 miles, you will enter the town of Leavenworth. Once in Leavenworth, turn right on 9th street and follow it for 2 blocks to Commercial Street. Turn right and continue for a couple of blocks to Division Street. Turn right and follow it to the end, parking at the Barn Beach Reserve. Alternately, you can stay on 9th street to Main street, turn right, and follow it a short distance to the parking lot at the end of the road. No pass is needed for parking. Both of these snowshoe trails are near the town of Leavenworth, WA – one of the states premier tourist destinations. If you have the time, I highly suggest making it an overnight or weekend trip so you can do both of these trails enjoy Leavenworth in winter. It’s especially pretty in the winter evenings when the town is lit up with Christmas lights. In January, Leavenworth hosts Bavarian Icefest where you can see some pretty cool ice sculptures. 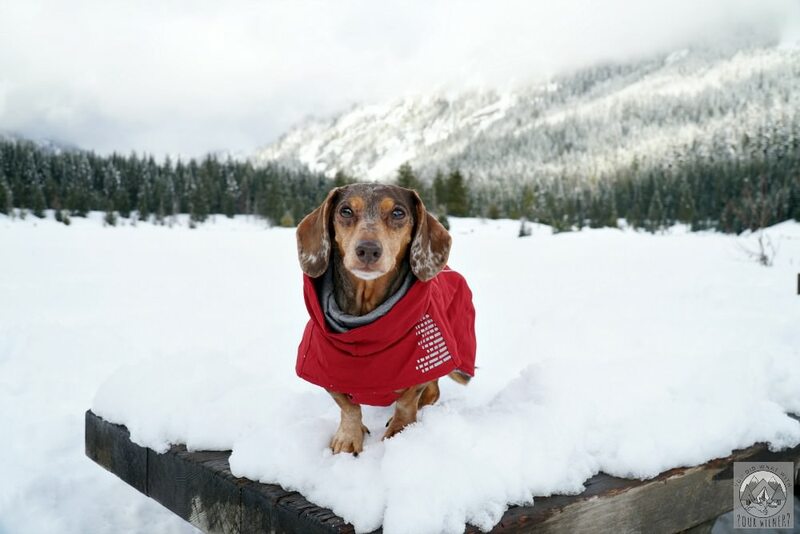 There are several dog-friendly hotels in town like the Obertal Inn, Icicle Village Resort, and the Sleeping Lady Resort. There is also winter camping at Lake Wenatchee State Park* and the Leavenworth/Pine Village KOA. Dog-friendly restaurants in town include the Fresh Burger Café (if their deck is open open), Uncle Uli’s Pub, the Munchen Haus, or the Leavenworth Pizza Company (if their deck is open). After dinner you can take your dog and grab a beer at the Icicle Brewing Company or enjoy a glass of wine at the Goose Ridge Estate tasting room. *note: During winter months, both Wenatchee State Park campgrounds are closed. However, during this time camping is available in a designated area of the south park day-use area. This area has picnic tables, fire pits and two covered day-use shelters. Heated restrooms and hot showers are located nearby. Utility hook-ups are not available during the winter months. When you are sharing the trails with XC skiiers, please stay off to the side as to not mess up the groomed tracks. That includes your dog so keep them on a leash or immediately by your side under strict voice control. Walking over the tracks digs up the surface and can make it difficult for the skiiers and even dangerous. If your dog is on a leash, and you use a felxi-lead, make sure to keep it shortened to avoid any accidents. Skiiers can come up quickly behind you. They may not see the leash and you might not notice them in time to retract it. Many winter parking areas in Washington State require some kind of parking permit. The main ones you’ll need for these hikes include the Sno-Park Permit, extra grooming sticker for that permit, and/or State Park Discover Pass. You’ll only need 1 or 2 for each area but deciding which ones can be confusing. To make it easy, here is what permit(s) you need for the trails I listed. Get out there with your dog and have fun!